Retailers will be interested to hear that Kreinik is currently running a spring scissor sale on gold-handle stork and lion's tail 3 1/2" embroidery scissors (contact Kreinik Customer Service for details). These are Premax brand, made in northern Italy, featuring the ever-popular, nature-themed handles. If you are a stitcher, now is the time to get extra pairs of these handy tools; just tell your retailer how many you need. You may want a separate pair of scissors in each project bag, or want a little gift for an Easter basket, spring luncheon, or Mother's Day present. Kreinik offers these with plain edge or a serrated blade (better for cutting metallic threads). You have probably seen a pair of stork embroidery scissors in your grandmother's sewing basket or in antique stores. The pattern seems to be timeless. 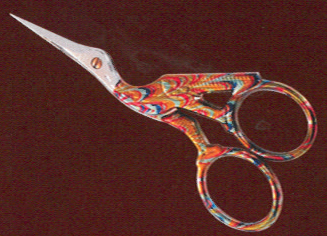 It is probably the most popular pattern of scissor sold today. We started wondering why…Is it because we love birds? Or is the nature-theme just "cute"? Where did the "stork" theme come from? Mythology and folklore going back to Ancient Greece, Egypt, Biblical times, and Chinese dynasties all connect the nesting, protective, graceful characteristics of storks with motherhood, babies, and deeper beliefs of things like "transporting souls". Cartoons, greeting cards, and children's books today continue to show storks delivering newborns to happy parents. Most of us see a stork image and immediately think of babies. The stork pattern was apparently first used by a savvy tool maker in France who crafted umbilical clamps for midwives in the 1800s; he connected the maternal symbolism of a stork with a tool used in childbirth. We found one web site with a fascinating article about the origin of stork scissors, including photos of these early tools. The photos show how the medical implement evolved to become a more refined sewing scissor. 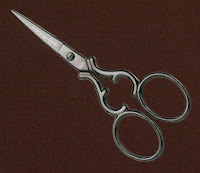 Check it out here: http://www.creweljewels.com/Stork-Scissors-s/81.htm. Stork scissors seem to be a creative connection from century to century. The theme embraces the past (we even found stork scissors sold on a company selling to living history re-enactors) and today's manufacturing makes them refined for our times. Did your grandmother have a pair of stork scissors? Do you have a pair? Which scissors should you use with metallic threads? 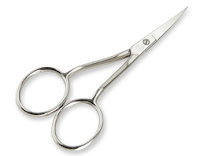 Word on the street is that metallic threads can dull your scissors, so you should always keep a separate pair of "metallic only" scissors, labeled as such. Is this true? As a metallic thread maker, we can officially say "Yes." Metallic threads are denser than other types of thread and will dull a plain blade faster. We recommend using a serrated-edge scissor for your metallics. This means that the edge has high points and tiny ridges - like teeth - to "grab" your material as it is cut. It will help you control the cut, give you a strong cut, and make you happier in general. Anything that makes life easier makes us happy, right? Think of it this way…Whether in the kitchen or in the woods, you want to use a plain blade for some things and a serrated blade for others. A serrated-edge blade, for instance, is often used to cut dense materials like rope, canvas, vines, leather, or other thick, fibrous material. In the kitchen, use a serrated knife to cut tomatoes, celery, bread, or other fibrous foods. Choosing the right tool for the job makes the job easier and the result better. In your sewing or needlework basket, you may not need to write "only for metallics" on the blade, but it is a good idea to mark the serrated scissor in some way to differentiate it from smooth-edged scissors. You can usually feel the serrations, but if you need a quick, at-a-glance marker, engrave a "S" or put a small red dot on your serrated pair. Here at Kreinik, we use a S in our item codes to indicate a serrated edge. What about sharpening a serrated-edge scissor? Well, the good news is that serrations tend to stay sharp longer and may not require sharpening as frequently as a plain edge. Since the serrated scissor is not smooth, the serrated portion of the blade will stay sharper for a longer time because the entire blade is not coming in contact with the surface to be cut. So if you use your serrated-edge scissor for cutting metallic threads, you should be fine for many years. Kreinik carries scissors of all shapes and sizes in straight-edge and serrated blades. You can get small embroidery scissors or large dressmakers' shears with serrated edges. So as you buy scissors, consider what you want out of a scissor, how you will be using it, and what you will be cutting. Love what Pat Winter did with the Kreinik Make-A-Pen. She created a crazy quilt insert to go inside the Kreinik pen. Project instructions available in her Winter Issue of Gatherings online magazine: Click here to see details. See the Kreinik metallic threads?! Click here to visit Make-a-Pen web page. Get this product through needlework stores or www.kreinik.com. Makes a great gift. Also memory craft (use scraps from a loved one's closet or sewing chest). While on the road in Nashville for the TNNA Nashville show we had a visit from Susie Porter of Hot House Petunia Designs. Susie was showing off her catalog of fun punch needle charts she is selling through Cross My Heart Ltd. This cute design uses Kreinik Blending Filament in color # 032 Pearl to make a scrumptious cupcake. Need another reason to buy this chart? A portion of the profit from the sale of this chart will be donated to breast cancer research. This design features a cute cardinal and bear enjoying the snow unlike some other snow birds we all know hiding out down south. This design also uses Kreinik Blending Filament in color #032 Pearl.